Nowadays, most companies embrace personality tests and cognitive profiling methods as a tool to learn more about their people. Clearly, there is no shortage of such profiling tests that range from classic typologies (such as the Myers-Briggs Type Indicator (MBTI) or the DISC concept) over more cognitively-inclined tools (such as Herrmann Brain Dominance Instrument [HBDI] or Alan Black’s MIND Design Concept) to more recent additions such as Insights Discovery or TIPS, Thinkergy’s Innovation Profiling System. But have you ever encountered a person with the same cognitive profile as you who nevertheless approached life in very different ways? 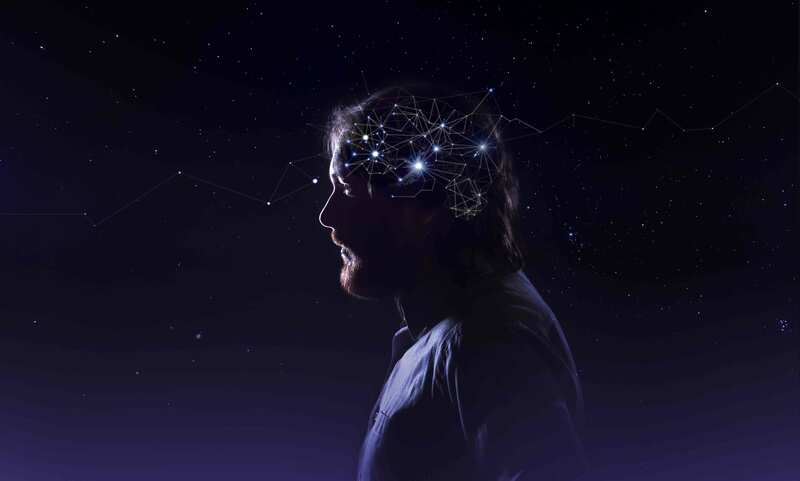 While some of these differences may go back to a different social, cultural, educational, professional and/or generational background, they are frequently due to a factor that is greatly overlooked by business: consciousness. Consciousness can be defined as the state of being aware of one’s surroundings, or one’s perception of something or a person, or the fact of awareness by the mind of itself and the world. In other words, to be conscious means to operate at a certain level of observing awareness and a certain degree of freedom of choice when thinking, feeling, sensing and interacting with people and the environment. Highly conscious people have a greater levels of observing awareness. 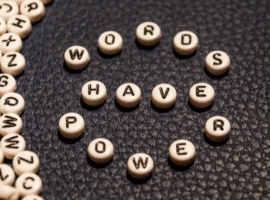 This allows them to be less automatic in their response to situations they encounter, and to rather make an intentional choice how to think about and act upon what’s going on around them and within them. As such, they are able to observe both their outer and inner worlds with detachment, and to “simply be” (as opposed to always having to do something). Presented in accelerating order, the life-suppressing emotional states are shame, guilt, apathy, grief, fear, desire, anger, and pride. All of these negative states calibrate below 200, which is the threshold to the positive consciousness levels. Courage is the first of the live-supporting mindsets at the entry level of 200, followed by neutrality (250), willingness (310), acceptance (350), reason (400), love (500), joy (540), peace (600), and enlightenment (700-1000). According to Hawkins’ observations, 85% of the world’s population lives on the life-suppressing, negative levels of consciousness below 200. Given so much negativity, why hasn’t humanity already destroyed our civilization? 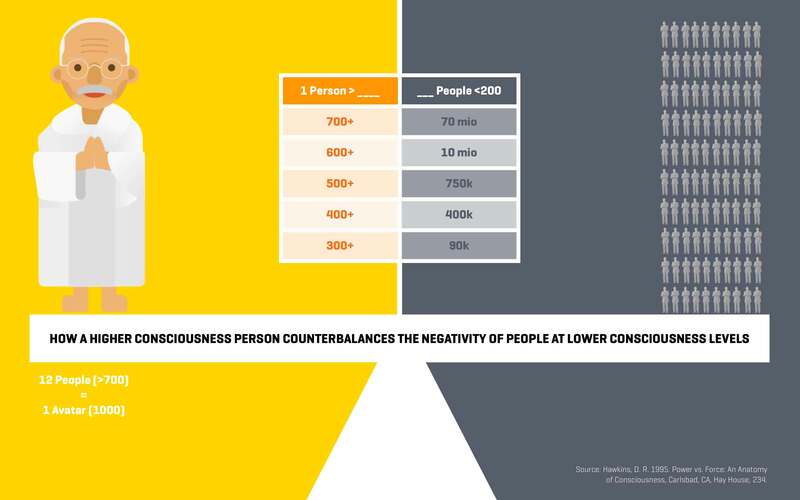 Hawkins suggests that the positivity of people operating on higher consciousness levels counterbalances the negativity of thousands or even millions of other people. This explains why Mahatma Gandhi (whom Hawkins calibrated at 760) was able to convince more than a hundred million people to follow his philosophy of non-violent resistance to end the British colonial rule in India. “Survival Sense” is the start level of Spiral Dynamics. In this Beige Meme, humans’ sole focus is about staying alive by following ones instincts and innate, automatic sensory responses. The Purple Meme on the next level is animistic and tribal in nature. Popularly described with the name “Kin Spirits”, humans bond here based on blood relationships to jointly master a mystical and scary world. Called “Power Gods”, the Red Meme describes a more egocentric approach to life by enforcing power over self, others, and nature through exploitative independence and dominance. “Truth Force” is the name of the Blue Meme. It is characterized by an authoritarian system of control and order, obedience to authority and an absolute belief in one right way or “truth”. The ambitious, materialistic Orange Meme is named “Strive Drive”. It focuses on making things better for oneself by emphasizing strategy and possibility thinking. “Human Bond” is the popular name of the Green Meme. It focuses on the equality and well-being of a community of people and on building consensus. Dubbed “Flex Flow”, the Yellow Meme describes humans who are able to flexibly adapt to change by synthesizing integrative, interconnected big picture views. Finally, the Turquoise Meme captures the vital few people (0.1%) who want to positively influence whole Earth dynamics and macro-level actions (“Global View”). 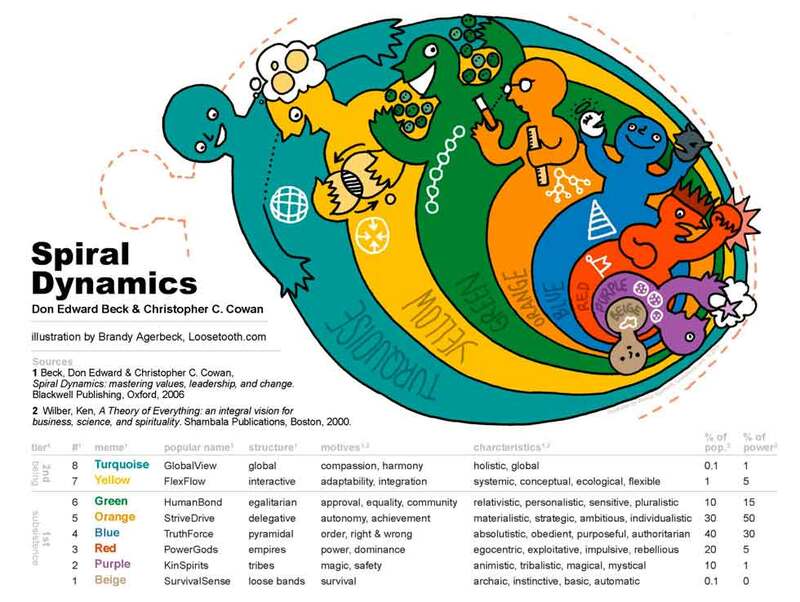 Just like Hawkins’ Anatomy of Consciousness, Beck & Cowan’s Spiral Dynamics can explain why people cooperate and collaborate, or come to conflict with each other over differences in values and the deep-rooted belief systems that form them. One example: In which meme of Spiral Dynamics, and at what level of Hawkins’ Map of Consciousness, would you position the former and current US presidents Obama and Trump? Where would you place the majority of people who voted for them? Can you spot how the political decisions of these two presidents reflect alternative values and beliefs positioned on different levels of consciousness? How can you expand your consciousness? In order to move to a higher level of consciousness, we need to experience certain situations and/or do certain exercises that allow us to first transform our attitudes and action routines from negative to positive, and then to advance to higher, more integrative and holistic states of conscious being. One way to expand your creativity and consciousness is to travel the Genius Journey, the creative leadership development method that I’ve developed for Thinkergy. The method employs a journey metaphor to help you acquire ten genius mindsets that are located on gradually expanding levels of consciousness. Genius Journey can transform blue or orange executives into yellow or even turquoise creative leaders. On Hawkins’ scale, Genius Journey can work for businesspeople who are on a level of at least 100, and can show them how to gradually expand their creative consciousness to the 400-540 range that may allow them to experience Eureka moments of subconscious peak creativity. 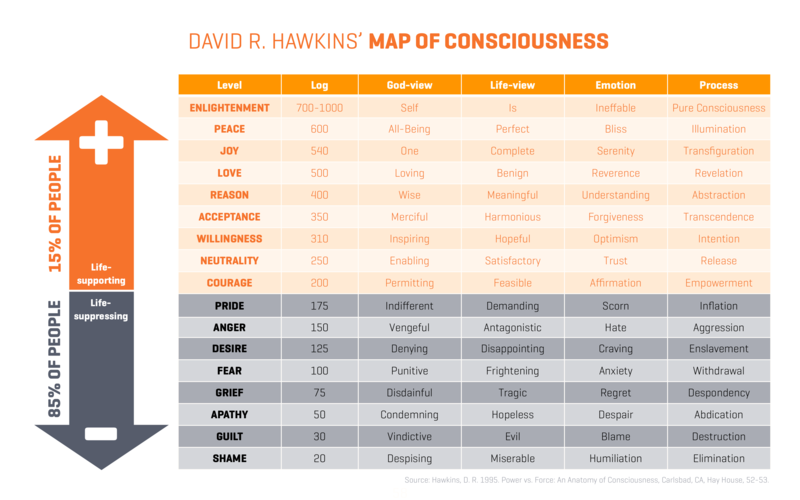 What if you strive even higher and aim for a consciousness level beyond 600 on Hawkins’ scale? Then you need to become a pupil of a spiritual guru who’s familiar with these states. As a creative leadership coach, I can only confidently talk about the levels below 600. Why should you bother to expand your consciousness? By 2030, humanity will need a third planet Earth to sustainably reproduce all that we consume (of course, we have only one). By 2050, the world’s population will have shot up from currently 7 to 9 billion people. According to Hawkins, 85% of those run on lower, life-suppressing states of consciousness and mostly focus only on getting more for themselves — and not on the greater good of humanity. Moreover, mastering artificial intelligence and digital transformation will require more members of humanity to evolve to a new level of whole-mind awareness; Beck and Cowan already see a new “Coral Meme” emerging that they characterize as “holonic” (i.e., being or involving something that is simultaneously a self-contained entity and a part of a larger system). To sum-up, humanity needs more creative leaders who operate on higher states of consciousness and make more meaningful decisions for the better of the world, their organizations, their followers and themselves. Are you interested to become one of them? Then take the first step today. Contact us to learn more about our Genius Journey creative leader training courses — and maybe even about our Genius Journey creative leadership coach licensing program.